Yesterday was Thanksgiving, and I'm thankful today that I can announce the initial public release of Narratopia, the conversational story game. You can buy a copy at thegamecrafter.com. Now I'll tell those who are interested what has been happening with Narratopia over the past several months. As you might remember, I introduced an early version of the game back in February ("Welcome to Narratopia"). I asked for volunteers to play the game and report back. Ten people got copies of the game, and six sent feedback. Some sent more and some sent less, but every word was useful. I would especially like to thank Joseph Gamblin, Ron Donaldson, David Hutchens, and Adelle Kurtz for extensive and detailed feedback, which helped enormously. I've also played the game more at home and with relatives and friends. 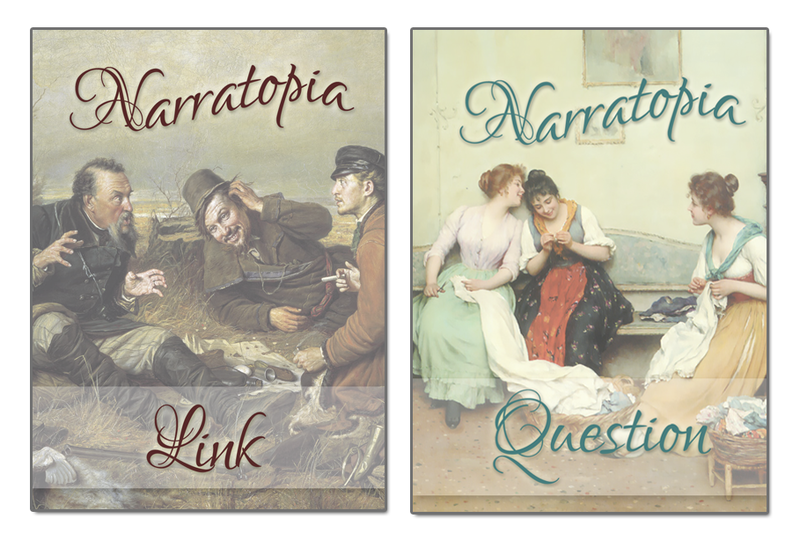 By the time NarraFirma was released, I was ready to get back to working on Narratopia. 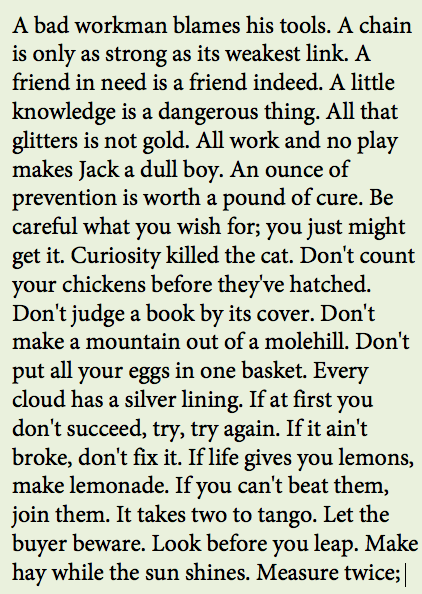 Here is what I learned and changed. When I first started working on Narratopia, I went looking for public domain pictures of people telling each other stories. I didn't want to use contemporary clip art, because I wanted to reference the way people did things in the past. I chose two paintings (out of about a dozen candidates): one of three men (called "The Hunters"), and another of three women (called "The Gossips"). The card backs looked like this. Reactions to the images among play testers were mixed. Some people said they liked the pictures and were reminded of times past. But other people said the pictures made them feel like they were in a museum, or like they were expected to do something related to fine art or Shakespearean theatre. That was not the impression I wanted to give. This was a big decision. I thought (for months) about what I wanted the game's graphics to say. What exactly did I mean by "Narratopia"? What kind of utopia was I talking about? I tried out some images of stories having their own "land," but that wasn't what I meant. What I meant by Narratopia was people living in a world where everybody shares stories every day, not just for a few minutes, like we do, but for hours a day. Like people did a long time ago. A long, long time ago. The problem wasn't that my "paintings" images were too old. They were too young. I had to go further back. So I started looking at petroglyphs and cave paintings. There was quite a symbolic language back then, with waves and spirals and so on; and some of those meanings have not changed in thousands of years. 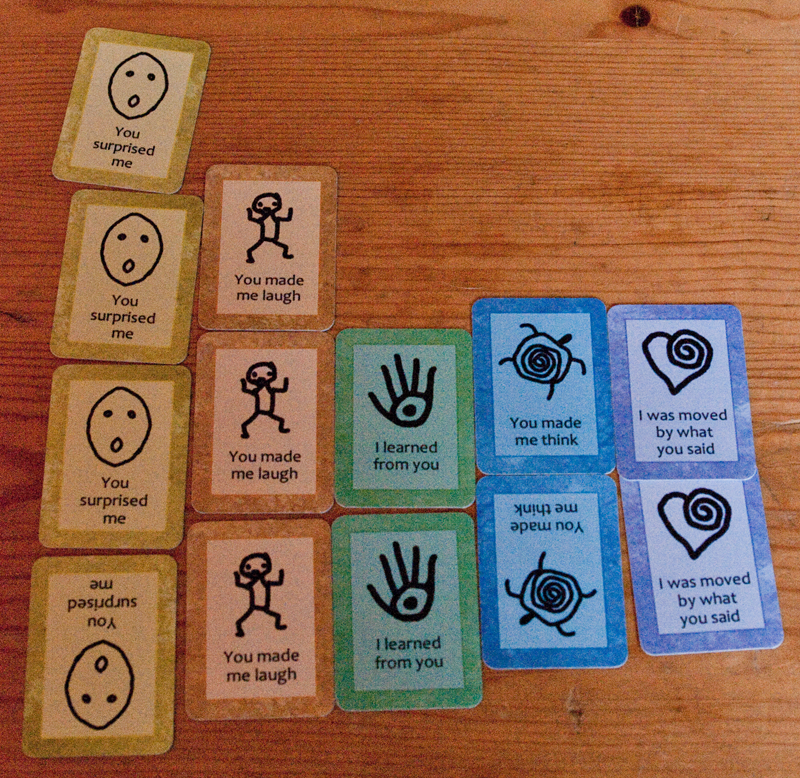 I drew (about 50 versions of) a petroglyph-style image of people telling stories around a campfire (which you see here on the game's new box front). Obviously this particular image isn't scratched onto any rock anywhere, but its elements can be found in real petroglyphs, and the whole thing is inspired by the styles you find in prehistoric art. I "etched" the drawing into a photograph of a rock I took a few years ago. (I put the pine cones there as a joke about how looking at nature could be as interesting as looking at television.) I think (I hope) this creates an image of someone stumbling over an ancient, forgotten treasure. Next I replaced all of the game's symbolism with images either taken directly (traced) from (photos of) petroglyphs or inspired by them. I also changed the fonts to be more evocative of times long past. And I made the card fronts and backs more consistent. All of the graphics have a stone background, which connects them together better. 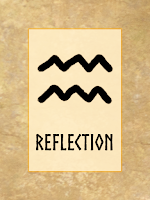 Some of the icons are "etched" into the rock (like the spiral on the back of the question card) and some are in black (like the spiral on the front). That was inspired by the many instances I found of petroglyphs copied (by anthropologists) and shown in solid black, almost like rubbings. The image is (supposed to be) of something that was lost and now is found. I'm pretty happy with the game's new look. I think it gives the game a coherence it didn't have before. I also think it more clearly puts forth the message of going back in time. It's a good sign that I was embarrassed to show the old images to you here (and I couldn't get rid of the old web site fast enough). Of course it's also possible that I'll feel that way about these images years from now, but I hope not (too much). It's for role playing, like Dungeons and Dragons. It's for improvisation, like stand-up comedy practice. It's for learning how to express yourself, like a public speaking course. It's for family and team meetings, to have a deeper conversation. Of all of the perceptions I heard, I liked the last one best. I started thinking about those "dinner table games" you are supposed to keep on your table and draw topics from to discuss while you eat. Narratopia is actually a lot like those games, because it is about enhancing a conversation you might already have, making it better and more interesting. So putting the game in the genre of conversational games seems like the best way of setting expectations that are in line with what the game is actually about. Since I started using the new tag line, I only get the one reaction: "Oh, it's for improving your conversations." I'm okay with that. 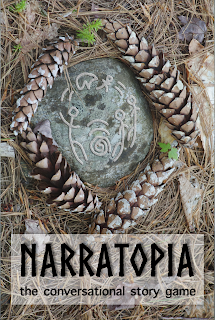 When I first started working on Narratopia, I knew that I wanted people to connect their stories together into a tree or web of some kind, because that's what people do in conversation. But I couldn't figure out how I wanted people to start telling stories. 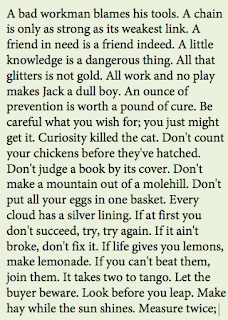 I spent a long time drawing up a grand list of hundreds of proverbs that I thought would remind people of stories to tell, like "Green with envy" and "Burning bridges" and "Don't judge a book by its cover." In the first versions, this list took up half of the instructions. It wasn't long before I realized this wasn't necessary. Asking people to simply look back and think of something that has happened to them lately is all the "start" people need. In fact, my list of "game starters" seemed to intimidate people and move the game into the performance and improvisation space, which was not where I wanted it to be. Making the first story topic simpler, almost unimportant, presented less of an obstacle and gave the rest of the game - the connecting together - the attention I wanted it to have. So I went through several schemes before settling on a "guessing game" scenario. 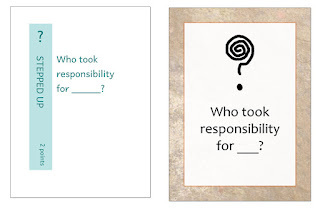 One player would tell a story; other players would ask questions; the player who told the story would choose their favorite question; and whoever asked the question would get a point. Players would win by knowing the other players well, or by listening well to the stories, or both. That was how the game went out in February. I wasn't happy with the guessing scheme, but I didn't know what else to do. I didn't want the game to be insipid, but I didn't want it to turn into a hundred other games with a storytelling dynamic where people are judged for the quality of their performances. This was probably the weakest point of the game in the beginning. The result? Everyone hated the guessing game. Some people just ignored the point system, because it was so useless. People proposed other systems, but they were all too close (in my mind) to quality-of-performance ratings. I was stuck on this point for months, until my sister played the game with my parents and another sister. Afterwards she described the game to me over the phone, and I was able to grill her in detail about what happened and how she felt. She told me that while the other people were telling stories, she kept wanting to give them something, to show them that she appreciated the things they were saying. She wanted a way to respond. This was a revelation. I had been thinking about scoring as an objective measurement. But conversational story sharing is not about objective measurement; it's about subjective reactions. I didn't need a scoring system; I needed a response system. This works much better. Giving each other the tokens now feels like having little celebrations. It's like telling those "wasn't it great when" stories on your way home from the big game or the family gathering. The tokens represent stories as they ripple out into widening circles. By the way, in the array of tokens shown here, the last three are traced directly from photographs of petroglyphs. The spiral turtle (blue) is a combination of turtle and spiral petroglyphs. The heart (purple) is inspired by a tattoo design (and a rock album, and a 1935 movie) I found when searching for petroglyphs of hearts. The player who is taking their turn tells a story. Unless it's the first story of the game, they connect their story to another story somebody has already told. Everyone else asks questions about the story, and the storyteller responds. Everyone gives each other tokens to represent their view of what just happened. The nice thing about this structure is that each turn is itself a story. The turn begins with the telling of a story, gets more complicated when people exchange questions and answers, and resolves itself as people reflect on what happened. As to the physical form of the tokens, at first I wanted them to be some kind of coins or chits or other little objects that might seem of value. 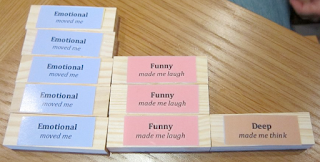 One of the play testers, Ron Donaldson, took my token images (the first ones, without the petroglyphs) and pasted them onto little pieces of wood. He said the players in his game enjoyed having something substantial to give each other. I thought this was a great idea. TheGameCrafter had lots of options I could use to make physical tokens. They had little plastic shapes, and thick cardboard coins, and even little wooden sticks. 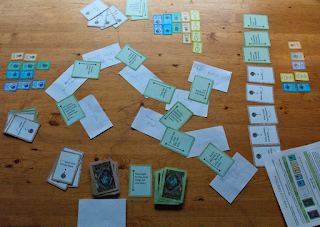 But I soon discovered that most of the options for tokens required two things: the price would have to go up, and the game's players would have to do something to use the tokens. They would have to separate cardboard coins from a backing/printing sheet, or they would have to put stickers onto the little sticks of wood. Worse, either of these options required that I move up to a bigger box, which increased the cost even more. There was one other option I could use: micro cards, which are half-size, quarter-area playing cards. They are just like normal-sized cards in feel (so they're familiar); they fit nicely into the same box I needed for the cards; and they don't require people to do anything to make them usable. I've played with the micro-cards a few times now. They do slip around a little, but they're nice to hold. They're kind of cute, like baby cards, and passing them around does feel like giving each other little gifts. I can see having something more substantial in the future, but for now these are fine. Ron Donaldson (who suggested the little wooden sticks) also made another excellent observation. At the end of the game, you can arrange your tokens into little bar graphs, like the one below (and the one above, with the wooden sticks). The patterns you see from player to player are revealing. For example, when we play the game in my family, my son always gets more "You surprised me" and "You made me laugh" tokens than anyone else. Making the bar graphs creates another level of story within the game. 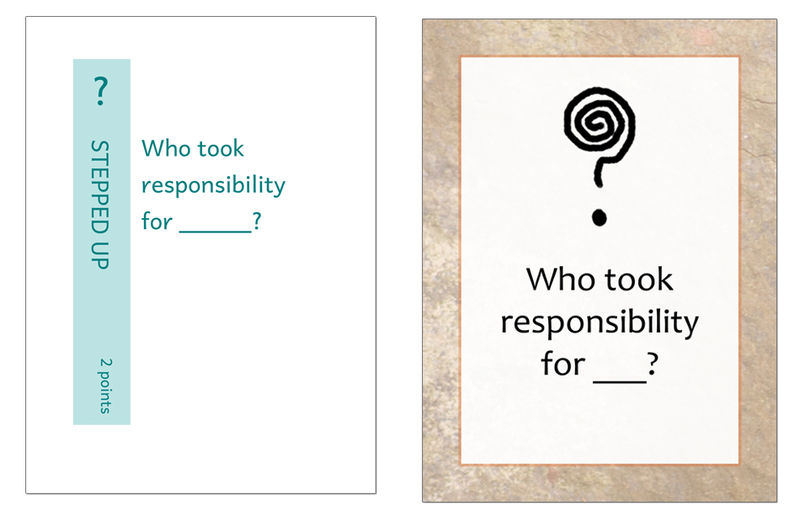 The larger story starts with the reading of the instructions and the distribution of the cards (that's the orientation), continues through the complication of the turn-taking, and comes to a resolution when the bar graphs are compared. Thus the game is a story made of stories about stories. I'm actually a little bit angry at myself for not having understood much sooner that a game about story sharing would have to be a story made of stories. It's so obvious in retrospect. Finally, I needed a name for the tokens (other than just "tokens"). I tried reactions, responses, echoes, ripples, and observations, but settled on reflections as the best way of describing what is happening. People are thinking about, pondering, considering what has just happened, and you could also say that they are looking into a reflecting mirror together. 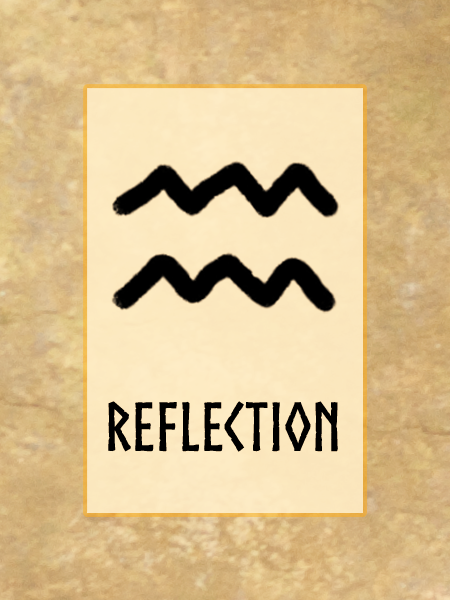 The word also lines up with the other types of cards: connections, questions, reflections. I'll concede that the language isn't exciting. But I think it's more important that the language be accurate, so people quickly understand what the game wants them to do. These words seem to work. So where is the game's challenge? How do you win? Well, I do have it in the rules that players can count how many reflection cards they got in total, and whoever gets the most "wins." 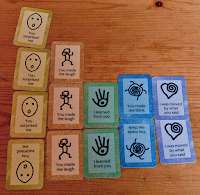 And there is a sort of winning in getting the most of any type of token ("I won surprise, you won thinking"). But I see those things as more of interesting outcomes than goals. I've come to believe that this game is never going to be about winning in the conventional sense. It doesn't want to be. I always say that when you work on a project for long enough, when you think about it waking up and falling asleep for months or years, it begins to speak to you and tell you want it wants to be. I've had many long conversations with Narratopia, and I can tell you that the game does not want to be about winning in the conventional sense. I've told the game that this might mean it will never have widespread appeal, but I don't think the game cares. The way you win at Narratopia, the way you "beat the game," is, when you look at the web of stories you've built, and you look at the bar graphs you've created, you feel like something has happened that was worth being part of. That's actually quite a satisfying, even fun, feeling. It's hard to describe, but it's real. When my son and I play Settlers of Catan or Monopoly, or any other "clear winner" game, we often include "extra" players who don't exist, to make the game more interesting for us. The extra players don't really do anything; they just roll the dice and make boring choices (usually choices that favor us) so we can have a more complicated game. You couldn't do that in Narratopia. No matter how many extra players you made up, you'd still tell your own stories, because that's the way the game works. Narratopia does not draw its energy from the interaction of its game components. It draws its energy from the hidden connections among experiences that the game helps you discover. It is the discovery of those hidden connections - like an anthropology of relationship - that is the game's accomplishment. This proposition will not be attractive to everyone. A lot of games "sweep you away" into a different world, a world where someone else's imagination provides the power, and you enjoy the ride. Narratopia asks more from its players than most games, but it gives them more in return. That's the challenge, to imbue the game with your own meaning, to discover your own connections. But it's not a challenge that is obvious from the outside. It's going to have to be one of those "you have to play it to understand it" games. I may not be happy with that, but the game is fine with it. Now we get to some possibly boring details about the bulk of the game's content, which is what's written on the cards. I'll just run through the changes here quickly because (if anybody's left) you must be half asleep. The number of cards. The number of unique cards in the game has gone up and down a few times. The version I sent out in January was slimmed down from my original set, because I thought people might find too many unique cards confusing. It had 24 cards of each type (question and connection), with two copies of each card. People did not like the repeated cards. Coming across the same cards again was not (as I supposed) reassuring. It was just annoying. So in this version there are 50 unique cards of each type. I've played the game both ways. Having more unique cards is better, because you are always interested in what you might get next. Card difficulty. Because the list of card texts I sent out in February was a subset of my original list, I had chosen to keep most of my favorite cards, which happened to be some of the more complicated ones. People said they were daunted by the cards I included (like "What do you think ___ would think about this?") and wanted some simpler ones (like "When did ___?"). People said they sometimes found themselves unable to use any of the cards they held in their hands, and they were frustrated that the game asked them to do things they didn't feel capable of doing. I thought about this while I was expanding the number of cards. Now that there are 50 unique cards, I made sure that quite a few of the cards are simpler, both in language and in concept. Now people seem to find using the cards less of a stumbling block, easier to pick up and run with. Card complexity. Originally the cards had lots of information on them: an icon, a title, a sentence, and a point score (for the stupid point system). As my testers told me, this was messy, complicated, and too much to take in. I got rid of the title and point score (which were mostly just me talking to myself). Now the cards have only two things on them: an icon and a sentence. Removing the extra information also allowed me to make the font much bigger, which is helpful in reading the card at a glance. I also added a notepad to the game, because it seemed too amateurish to ask people to find paper to write their story names on. The notepad is simple, but the game feels more like a real game with it in the box. At this point I think the game has found a good resting place, and I'm just making tiny tweaks that don't matter much. Now the game wants more people to try it. I'm hoping to get feedback from new players in the months to come. There are some further developments I'd like to consider in the future. The most obvious is to produce the game more cheaply. TheGameCrafter.com is a wonderful service for prototyping games, but once you get to really selling, the prices and shipping times become prohibitive. If I can put together some large bulk orders, the price might be cut in half. So there could be a Kickstarter in the future, but we'll see what happens. Everything depends on demand. Most of the things I produce end up being sleepers, spread very slowly by word of mouth. That's partly my fault, because I'd rather move on and produce more stuff than spend all my time telling everybody about the last thing I've made. But it's also in the nature of Narratopia being a niche game that lots of people won't understand up front, that it will spread (if it spreads) slowly. I'm okay with that. My other idea about Narratopia's future is tentative but beguiling. The idea is to produce expansion packs for particular topic areas people want to talk about. They might be subjects like health care, family therapy, software development, product development, community development, and so on. I would write special cards of each type to fit the conversation more closely to the needs and concerns of whoever is playing the game. I would probably want to collaborate with people who know a lot about these areas. I have yet to really think this idea through. It's an idea for next year. Another obvious idea is to translate the game. A Dutch translation is in the works already. If you'd like to help by translating the game into another language, let me know. There's also some talk in my house about making an app, or a PC game, or some other thing to help people play the game across large distances (say for spread-out families or work teams). But having just come out of our last "it'll take three months" project, we've kept a lid on those discussions for now. If you have any feedback for me about the game, whether you play it or just look at it online, please do send me an email (cfkurtz at cfkurtz dot com). I am eager to hear what you think. If you like the game, please give it a rating on the gamecrafter.com web site, and maybe a review. That would be helpful. And tell people. Its like you read my mind! You appear to know a lot about this, like you wrote the book in it or something. I think that you can do with a few pics to drive the message home a little bit, but instead of that, this is great blog. An excellent read. I'll definitely be back. Flattery will get you nowhere, spammer, and it's "It's." (Still, I added more "pics.") Anyway, just a heads up.